fashionably petite: Spa Week Spring 2010 is Here! Here's a list of participating spas in New York. 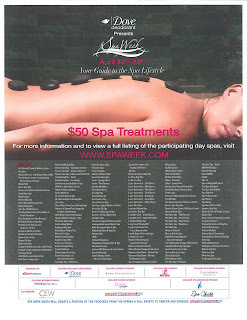 For more information, go to www.spaweek.com. Happy Spa Week everyone! It's your week to enjoy a relaxing facial, massage or other spa treatment of your choice for $50! Exhale Spa is definitely on my list to try out, but I do have a few recommendations in the NYC area - if you need a bikini wax, try Completely Bare. I've tried Jurlique's facial during Spa Week before. They didn't offer extractions but I did feel refreshed after their facial, and love Jurlique's products. I was so happy during a previous spa week experience, I bought a spa package consisting of facials and aromatherapy massages at Nina's Day Spa and Laser Center. They are located in mid-town, a few minutes from my office, which makes it very convenient for me. So take your pick and indulge! I'd love to hear about your spa experience!